Gamification is the application of game mechanics and game design methods to non-game activities to engage and motivate people to achieve set goals. Typically this revolves around giving users a sense of their status and achievement by recognising desired behaviours with rewards such as points, badges, medals, virtual currency, and trophies. Gamification is frequently used in digital marketing to improve engagement by making the customer experience more fun and exciting. However, gamification often lacks real game-like characteristics as games require systems and rules to provide fun and enjoyment. In many cases gamification simply means giving users points and badges as a reward without employing the underlying mechanics that make games engaging and rewarding. Research indicates that if rewards are not linked to competency there is a danger that achievements can reduce intrinsic motivation (see overjustification effect). Gamification need to measure more than effort as otherwise it may fail to be intrinsically interesting and its effectiveness is likely to be short-lived. In such circumstances it could actually reduce conversion rates rather than improve them. Zombies, Run! Is one of the more successful examples of an app that uses gamification to turn a mundane activity into an adventure. The app has been downloaded more than three million times and has over 250,000 active users. Players listen to an audio story as they run about how they can help a small group of people survive the aftermath of the zombie apocalypse. Without warning players are routinely chased by zombies and have to increase their speed by 20% to escape danger. The app is structured like a TV series with over 250 episodes that players can subscribe to. eBay is probably the most well-known sites that has successfully incorporated gamification elements into its user journeys. The whole bidding process creates that sense of competition and engages the emotions whether you win or lose an item. Further, it’s in the user’s interest to improve their status by increasing their seller’s %, get more stars and obtain good feedback ratings. eBay plays on a number cognitive biases and heuristics including scarcity, loss aversion and the endowment effect. Key success factors in gamification. To use gamification effectively for a non-game activity is important to consider the following eight issues. 1. Be as inclusive as possible. When setting out to gamify a behaviour it is important to avoid being too restrictive in who can participate in the program. People are bound to drop out during the programme and so it helps to start with as wide a net as possible. The more users you can engage at the beginning of the process, the more you are likely to have left as the program progresses. 2. Don’t try and gamify a poor product. Gamification won’t fix a poor product or user experience. The underlying proposition needs to be compelling for gamification to sustain interest and participation in a program. However, much you might gamify a product or service it won’t deliver a sustainable uplift in customer engagement if the product fails to deliver what the users expect it to provide. 3. Identify all the behaviours that you need to influence. To improve productivity or engagement you need to understand all the individual behaviours that influence your target output. Unless you fully understand each of these behaviours you cannot expect to be able to influence the high level goal. 4. Set up behavioural tracking. You won’t be able to tell if gamification is improving targeted behaviours unless you can measure them. Having an analytics platform for tracking, measurement and inference is essential to understand how your interventions are working or not. 5. Watch out for unintended consequences. The greatest danger with rewarding a behaviour with an incentive is that it can lead to unintended consequences as people try to game the system. The cobra effect as it is called results from any small difference between targets and the desired outcome. Gamification can also result in obsessive and addictive behaviour. 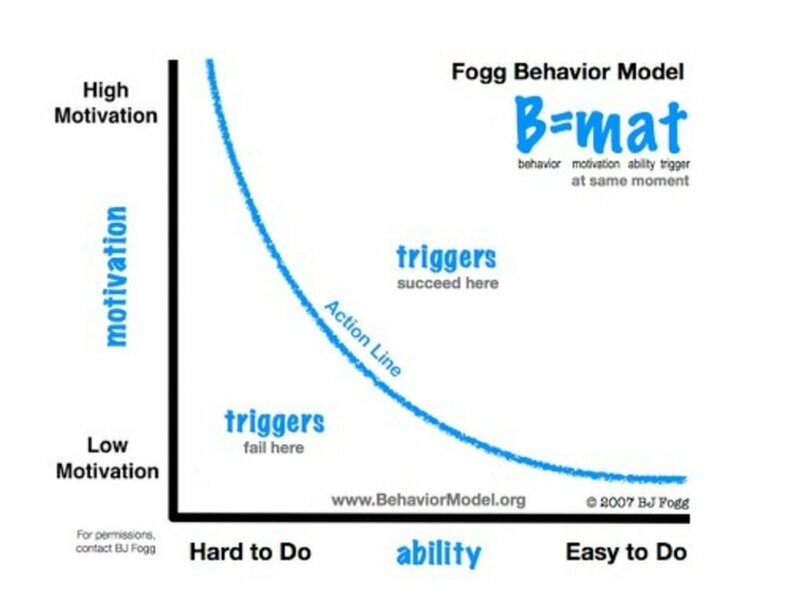 Are people motivated to enough to complete the behaviour? Do they have the ability and resources to successfully undertake the behaviour? What is the trigger that results in the behaviour? All these factors need to be present to ensure people reliably carry out the tasks required. Gamification programs need to make tasks easier for people to complete so that friction does not prevent them from undertaking the desired behaviours. People are more willing to engage with a program if their motivation is matched by a significant improvement in their ability to perform tasks due to active participation. 7. Identify the timescales for your behavioural change. The nature of your gamification program will be heavily influenced by the timescales for driving behavioural change. Different tools and strategies will be required depending upon whether your time horizon is a few days, weeks, months or years. Here is the gamification spectrum developed by Dr Michael Wu. 8. Establish a user community. Where your timescales for gamification feedback is more than a few weeks you will need to build a community as otherwise tools such as leaderboards won’t be effective. This is because if people don’t know who they are playing against they are less likely to care about where they appear in a leaderboard. It is important to encourage frequent participation to maintain interest and engagement. This means having a wide range of participation levels and gamifying behaviours that occur frequently (e.g. sharing photos or ideas). 10. Ensure behaviours have a real purpose. People are motivated to carry out meaningful tasks that have a real purpose. Gamification can be undermined if you gamify behaviours that don’t have any real purpose or value to participants. This will just annoy people and destroy your credibility. 11. Avoid trying to gamify an existing business process. Although gamifying an existing business process may provide a short-term boost to productivity it won’t work in the long run as the novelty soon wears off. It often has a negative impact on productivity in the medium to long-term as it distracts from the real-work and is generally not perceived to be fun even with a game on top of it. Gamification also works best where participation is voluntary as otherwise it becomes work not fun. There has been a lot of hype about gamification which has not helped with identifying the true value of gamifying non-game activities. A lot of gamification has failed because a few trophies and points have been added to an activity without designing the systems and rules to create an engaging and fun experience. However, apps such as Zombies, Run! demonstrate that if the necessary thought and planning goes into the process of gamification it can help attract and retain customers to complete routine activities.